Enviro-Vac’s shrink wrap containment systems for cold weather are suitable for construction, scaffold companies, ship yards, restoration and hazardous materials companies. Enviro-Vac shrink-wrap system can be engineered to fit around any scaffold or structure and are ideally suited for negative-pressure containments for hazardous materials abatement or to protect workers from the elements while performing maintenance. The professional looking Weather Wrap containment or shrink-wrap cover is fire retardant shrunk drum-tight and seamless. It can withstand the cold winds and snow of most Canadian winters. When you are working in extreme environments, like Canadian winters, you don't want any areas of your projects exposed to the elements. Enviro-Vac shrink-wrap system can be engineered to fit around any scaffold or structure and are ideally suited for negative-pressure containments for hazardous materials abatement. Our many years of experience in the industrial & marine sectors allow us to expertly tailor our shrink-wrap system to each projects unique requirement. 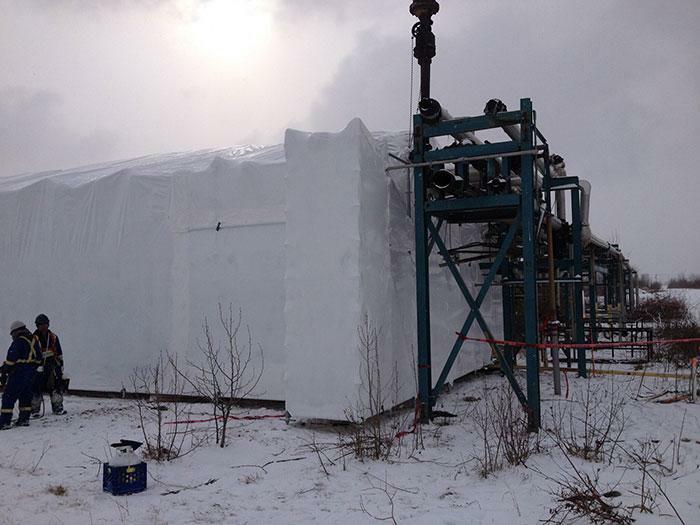 Please contact us if you have any questions about how an cold weather shrink wrap solution is right for your company.